I’ve been missing a lot of long weekends already because my job calls for a 24/7 duty, especially on busy seasons, where most of those long weekends fall. 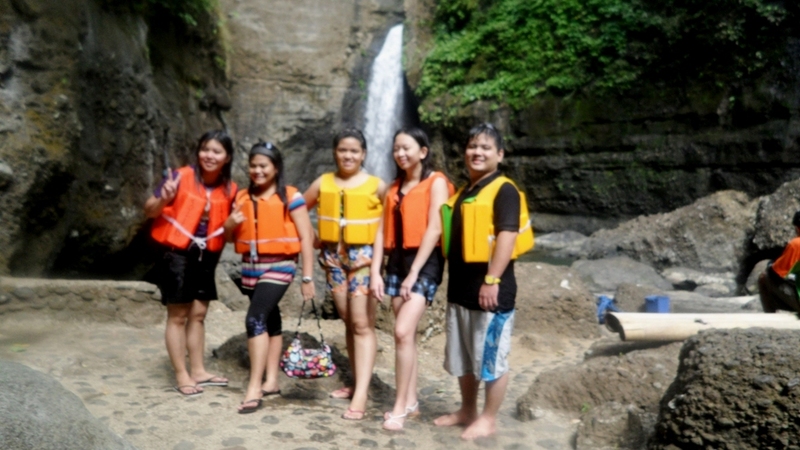 When we (me and my office tropa) finally got the chance to enjoy the May 1 long weekend, we decided to go to Pagsanjan Falls, in Laguna. “Mabuti pa ang biglaang lakad, natutuloy!” We didn’t prepare much, all we wanted was an activity during the long weekend, so off we went to Laguna! Good thing, we didn’t have to commute all the way to Laguna because my friend’s bf got a car, we only had to share for the gas. 08:00-11:00 (almost 3 hrs) – Alabang to Pagsanjan, Laguna (town proper), traffic was awful! ; we met up with my friend’s tito, who’s from Cavinti. He gave us the instructions and the rates for the Pagsanjan trip. 11:15-11:45 (30 mins) – Town proper to Cavinti. We registered for the trip. While we wait for the trek to start, we were given info on the history of Pagsanjan Falls. It was then that we knew that its former name was Magdapio Falls, where two sweethearts (I forgot the name though, forgive my disinterest in history! 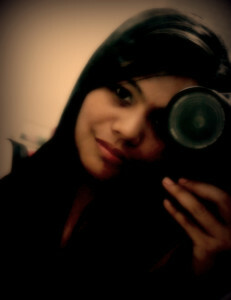 :)) committed suicide, love-related reason :). 12:00-12:50 (about 50 mins) – We simply wanted a little adventure that we opted to walk to reach Pagsanjan Falls, instead of taking the banca! P150-exciting trek to and down the falls + raft ride. A P10 discount is given to residences of Cavinti! :). Though we’re not from Cavinti, my friend’s tito is a local and was a former councilor, so we were given the discount! :) A different rate applies if you choose to take the banca going to the falls; i think it’s around P1,150 –>banca to and from Pagsanjan Falls + raft ride. Before we started the trek, we put on a harness! It was my first time to wear such a thing hehehe and I was wondering why we had to wear such, when we are just supposed to walk down a long staircase! That was what I thought! It’s a good thing that the stairs are cemented. During the walk/trek (whatever! ), we had to “rappel” down two vertical staircases! Tadah! [see Photos 1 and 2] so that’s the purpose of the harness! 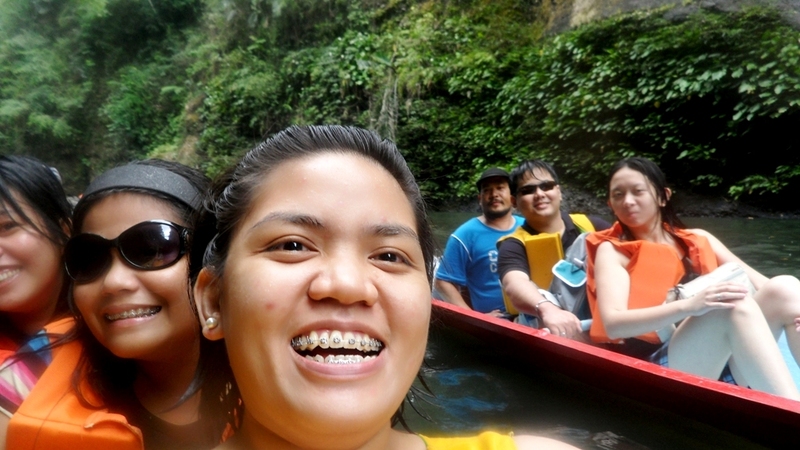 As a first-timer, I was quite nervous, that I might fall straight down to Pagsanjan Falls! hahahah! 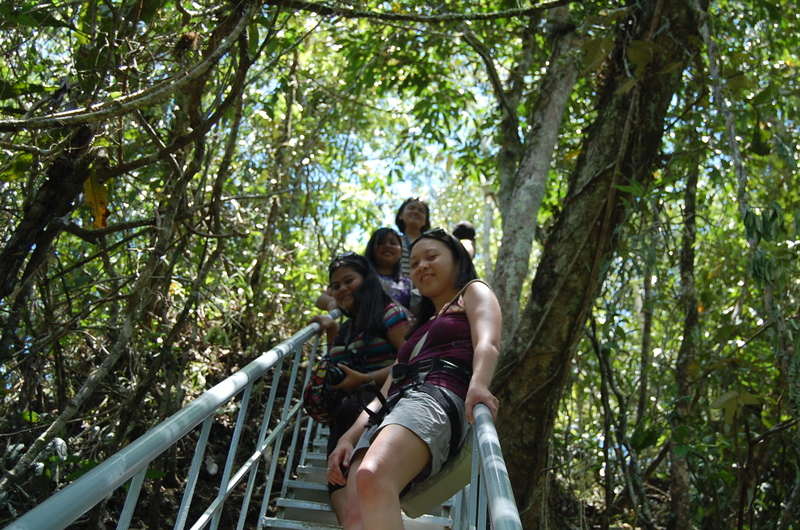 :) Thank goodness we managed to keep our trembling knees and reached the bottom safe and unharmed. Photo 3: The bankeros with their bancas in the middle of boulders of rocks! We were asked to lie down on the raft with our faces down, and get ready for the oupouring of the water on our backs. It could have been better if the water fell on our spines, but it didn’t! Our leg muscles were the target, and the “waterfall massage” was real painful!!! hahaha! :) It felt like the water was tearing our skin off our legs! But ’twas a fun experience though, and we got to scream at the top of our lungs like “tama na, kuya! masakit!“. 03:00-03:45 (45 mins) – P800 – banca ride [2 downstream rides + 1 upstream ride, just for experience’s sake]. After the raft ride, we proceeded with our next activity, Shooting the Rapids. We got to experience shooting the rapids (I honestly don’t get why it’s called shooting the rapids! haha!) during the downstream ride. Accordingly, there are about 14 rapids all in all. It was an exciting experience as we had to sail through a very rocky river!!! I am amazed by the skill of the bankeros in gliding and dragging the banca amidst big rocks! I am also impressed by the durability of their bancas for having to stand the “rough sail”. Based on my reading, nowadays, the bancas are locally built using fiberglass. Ah kaya pala! :) . There were actually a lot of bancas rowing the stretch of the river. I just realized it when we were on our way back to the Pagsanjan proper when all bancas lined up towards the “docking area” (hehe don’t know how to term it :) ). We then went to the house of one of the bankeros (which happened to be a friend of my friend’s Tito) to change our clothes.